There is no rest for a wicked-good thespian. After making the awards-season rounds for the Oscar-nominated The Big Short, Christian Bale returns to screen this week in Knight of Cups, a lyrical look at life in the Hollywood fast lane, courtesy of the world's most elusive, existential director, Terrence Malick. Bale plays Rick, a screenwriter who spends as much time strolling the Santa Monica Pier and reflecting on life as he does penning the next great blockbuster. Women -- including Cate Blanchett, Natalie Portman, and Freida Pinto -- come into and go out of his life. His brother/doppelganger Wes Bentley shows up to scream in his face. Los Angeles provides the backdrop, a hazy dreamscape of restaurants, pot shops, and studio backlots. Bale's face does most of the talking. Luckily, the actor uses actual words when dropped into conversation. We asked Bale what it's like to tackle a subject that hits close to home, why he recently quit a job over weight-gain concerns, and his real opinion on Girl Scout Cookies (which he chowed down on during the Academy Awards). You just attended the Academy Awards for The Big Short. 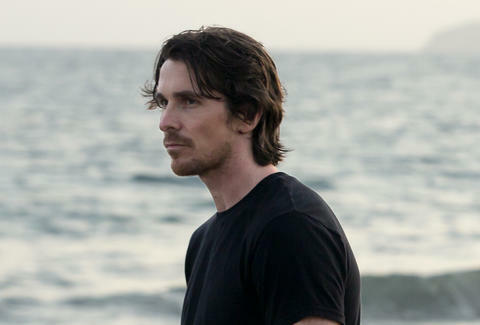 Was your Oscar night anything like Knight of Cups? Yes, actually. It would've been great to film there. Would've been perfect. Very surreal, out-of-body experience. Kind of beauty and ugliness all right next to each other. How can it not be? It's nonstop surreal. When it stops being that then you've lost something. 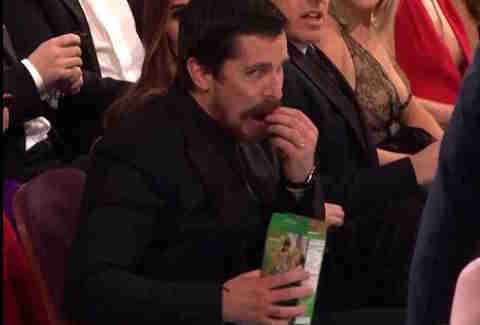 You ate Thin Mints at the Oscars. That felt surreal. Sorry -- Thin Mint, singular. Was it delicious? You don't like Girl Scout Cookies? Oh, come on. When you've got the munchies you'll eat anything. Knight of Cups is a sprawling spirit journey through show business. Was there a moment in the movie drawn from your own Hollywood experience? I don't really like to ever think of it that way with gags and stuff, but there's similarities in sort of the love/hate of LA. I do love it now but I recognize there's an awful lot I hate about it. When I first came out [here], I didn't like it. I first came out here to work when I was 17 and brought some of my family with me. I wasn't getting any work in England so I would come out here, but as soon as I was done working, I would head back to England where I just felt more comfortable -- a city like London being so different from Los Angeles. That, to me, was a proper city, and this was not. Then, gradually, spending more and more time... unlike Rick, I've really got attachments. I've got deep roots. My children were born here and my wife is from here and everything and all that, but gradually learning to see, there's actually so much that's fantastic about this city as well. How did you learn to love it? The architecture. There's ugly people, there's beautiful people. But in the same way that Rick is looking and beauty is kind of a terrible distraction and it's a wonderful guide. He's just trying to figure out which is which. Knight of Cups plays fast and loose with scene-setting and plot, unlike most of your movies. Were you working off a traditional script? Not a whole script. Not any script. I just got a character description. [Malick] told me to read The Moviegoer [by Walker Percy] and that was it. Other actors would get pages, which had, sometimes it sounded like riddles on it. Other times it was a bit more practical, and that was it. Now whether Terry actually possessed something, I can't answer you. I don't know because he certainly didn't show me if he did. I suspect it was mostly just in his head. That's a lot to give up. When you've got a conventional script, no matter how much you try not to recognize it, you know that there's a goal at the end of each scene, right? You know that you're trying to reach a certain spot so that it makes sense for the next to make sense. Whereas when you're doing a film like you are with Terry, there is no goal in each scene, it's "see what happens" and then he's going to put all the pieces together far more like a piece of music than the conventional film. So, no, very different. Just character descriptions given. We read The Moviegoer and the kind of journey that that character's on. Other than that, the whole point was never to get stuck in a rut. The minute that [Malick] saw that even one line was kind of being repeated in a way that it looked like the actor had sort of nailed it and felt happy with themselves that they were doing a good job, then that was the death of it for him and he would say, "Move on," or just don't say anything, be completely silent. That can be fine as well, he would be delighted with it. Did the experience remind you of working as a kid? You were 13 years old when you worked with Steven Spielberg on Empire of the Sun. Maybe you relied more on a director back then. No. I think that children do have a very naturally gifted ability for acting and then it all gets marked up when they start to kind of think about, "Oh, you did a good job, you did a bad job." That's when it becomes bad, when you start to evaluate yourself. Oh, I've been through every bloody one and I've had hundreds of times when I've said, "That's it, I'm done. I'm never going to do this again. I'm going to find something else. Stuff it." What movie made you feel that way? It's always like that. It's always a roller coaster of love/hate because you feel about it. It's not just a regular job, it's a passion and it should be, so therefore, sometimes you're actually depressed as hell about it and you make a crap film or somebody promises you something and then they don't come through with it at all, or you make a film that has bits that are good but other bits that are dumb. Then occasionally, "Whoa, Holy Grail!" and you actually get a film that you're really proud of. That happens quite rarely, but you're always in search of that. It's like an addiction. Malick is a big fan of Zoolander. Yeah, he always says that, but I think that's the same way that whenever anyone asks me, they say, "What's your favorite film?" I say, Beverly Hills Ninja. Wait, so you do or don't love Beverly Hills Ninja? 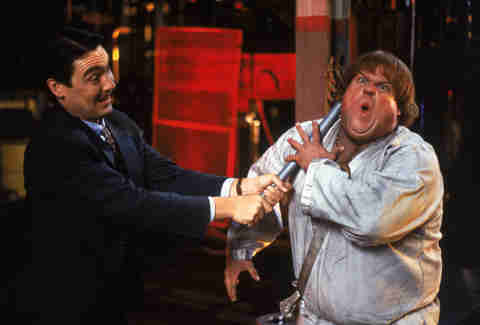 I really love Beverly Hills Ninja. I watched it two nights in a row and I cried with laughter at exactly the same moments each time. It's an easy answer that gets you out of having to go into much more big reasons about why you love something else that people would expect. That's not saying that Terry doesn't, he does love Zoolander and I will ask him if he's gonna go see Zoolander 2. Is it out yet? It came out earlier this month. Well, then I'll ask him if he has seen Zoolander 2. "I really love Beverly Hills Ninja. I watched it two nights in a row and I cried with laughter at exactly the same moments each time." In a way, Knight of Cups is Malick's Zoolander. There's modeling, there's celebrity cameos, there's facial expression... did you two ever talk about it? Did I do Blue Steel?? There's a little Blue Steel in there. Blue Steel! No, we never discussed that, so I love that's what you think of it. I have to tell him that. Have him call me with the answer. Malick made another movie around the same time as Knight of Cups. He filmed Ryan Gosling and Rooney Mara at a concert. You appear to be in that movie, but it's not totally clear. Back in 2011 we went to Austin together and we kind of did a lot of walking backstage at a music festival. On stage as well -- just improvised a lot. Had a wonderful day with different bands and musicians. I only did three days. Anyone who gets involved with a film with Terry, they're lying if they say that they know what the film's going to be like. So I could either end up being cut completely or I could be the lead, I've got no idea. Speaking of future movies and Thin Mints, you were going to make an Enzo Ferrari biopic with Heat director Michael Mann, then dropped out because you couldn't gain the weight to play him. What's the story there? No, it was once I gained the weight. Look, I wish Enzo had been a bit of a skinnier fellow, but he wasn't. I started because it's a wonderful script. I'm very good friends with Michael, we've done a lot of research, we traveled to Italy together. I love the piece. [But] I have had a series of accidents, and I'm now 42. My body was just screaming out to me saying, "You are going to regret this, something's going wrong." I got some red-flag warnings, which were significant enough that I actually started paying attention, because usually I just ignore that. This is one of the few occasions I had to say, "You know what? This isn't going to work and this could be disastrous," so I had to just call it. I regret it immensely because it was a very, very special piece.